If your studio is in need of eye catching marketing materials and clear concise copywriting that will create a lasting impression, I invite you to give me a call and find out what I can provide for you. My name is Karen Shapiro. 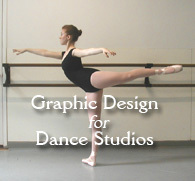 In addition to being a partner at Ira’s Peripheral Visions, I’m a Graphic Designer and Copywriter with expertise in dance. I am currently accepting new clients and seeking to build relationships with Studio Directors. I’ve been involved in the New York City dance scene for almost forty years, beginning in the 1970s when I studied ballet at American Ballet Theatre School. For the past fifteen years, I have been creating brochures, concert flyers, print ads, theater programs, journals, press kits, web sites and handling public relations for dance studios. I have also served a local ballet company as the Secretary of their Executive Board for the past seven years and I have worked as Marketing Director for a contemporary dance company. All of this experience has brought me an intimate awareness of the workings of dance studios and small dance companies. In addition, I work for Body Wrappers / Angelo Luzio as their dance writer. I attend over twenty-five dance concerts per year and review them. This gives me the opportunity to experience a wide variety of dance in New York City, from the elite ballet companies at Lincoln Center to the up and coming artists in small downtown venues. As a writer, it gives me great pleasure to promote the art of dance and to encourage others to discover it and to learn more about it. You can view and download my current brochure here. Please call or e-mail me for a price quote or to request a free sample.